THIS FOR IS FOR THE GROOM OR BRIDE TO USE. IF YOU ARE A MEMBER OF THE WEDDING USE THE OTHER FORMS ON THE WEBSITE. 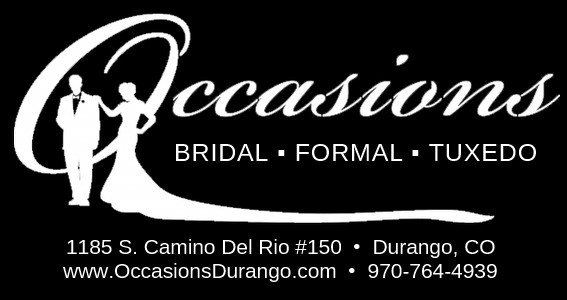 Thank you for renting your formal wear from Occasions. We are more than happy to assist you in any way we can. In order to process your order, we need you to understand a little about our process. If you have any questions, feel free to give us a call at 970-764-4939. The groom is responsible for making the decision about attire. We will not change the jacket, pants, vests or tie or shoes without your permission. Our rental packages do NOT come with shoes UNLESS the groom orders them. Our standard dress shirt is not a fitted shirt. A fitted shirt can be ordered for an additional charge. Measurements and payment must be received no later than 30 days prior to the event except for children and adolescents. Children and adolescents should be measured no sooner than two weeks prior to the event, however, payment is due 30 days prior. To insure a good fit, we recommend that your party gets measured professionally at our shop or any of these locations around the country. https://www.jimsformalwear/stores . Have them bring our fitting card with them when they get measured and make sure they get all of the measurements. We can not be responsible for the fit if they did not get professionally measured. Occasions is not responsible for changes in size (weight gain, weight loss, child growth). Orders are based on the measurement information provided. If the fit is incorrect, we will do our best to insure a proper fit, so it is important that your members try on on the rental as soon as possible so we have time to make adjustments. Occasions is not responsible for changes in the groom's or wedding party's situation. All payments are final. It is important thay your party comes in, as soon as the rentals are ready, and try on and pick up. This allows us emough time to make any adjustments, if needed. Rentals are usually ready to pick up two days prior to the event. We will contact you and each member (usually text) when the rental is ready to pick up. Please reply and let us know when you will be coming in. Make sure they bring dress socks to try on your shoes. You can not judge the fit of a shoe bare footed or with athletic socks. Rental items must be returned the next business day after the event. Usually Monday after a Saturday wedding. If you have members that are leaving town, you may have someone local return the rental. Do not clean or attempt to clean the rental. Please return rentals on hangers. Charges will be assessed at $50 per day for late returns to the credit card on file. The non-refundable damage waiver does not protect against malicious damage or lost items. It does protect against accidental damage such as spills, stains or lost buttons. Charges will be assessed to the credit card on file for missing or damages items. Please register everyone that will be renting from us. If you have a larger party, list their contact info here.